If you follow me on Twitter you'll know that I love gardening. 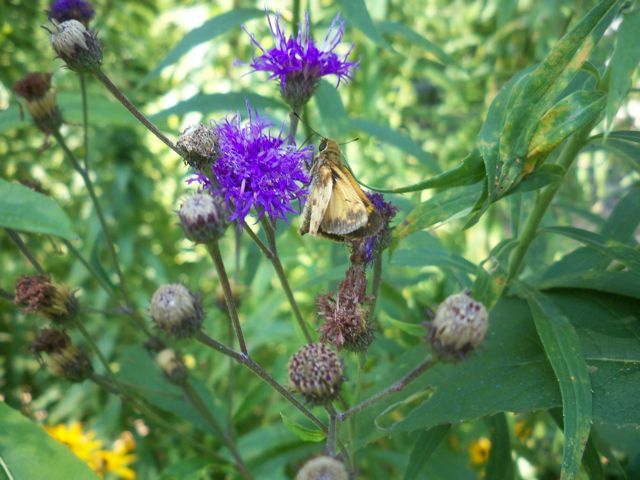 I don't grow vegetables or anything useful--instead, I focus on native plants and flowers for pollinators. But my garden is a great metaphor for my classroom. 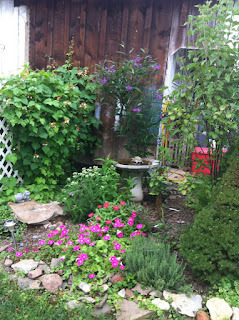 In fact, here are some things my garden has taught me about teaching. In the garden, messy is beautiful! Last week I was trimming along the edges of a raised bed. The tiny crickets started jumping out. When I looked more closely, I saw spiders, roly-polys, and a whole world of mini beasts. I decided to trim more carefully, leaving some of the taller vegetation. These messy spots are home to so much diversity! In the classroom, the messy edges are the places where innovation happens. Sometimes these are the places where students try out something new or practice a skill. Sometimes these are the messy edges of my own teaching where I question a traditional strategy and create a better way. As I've taught about the importance of native plants, I've planted more and more bushes and trees around my yard. I only have four-tenths of an acre but I seem to be filling it well. Slowly, a yard that started out as bright and sunny has changed. The section that was once the brightest and sunniest is now densely shaded. This happened so slowly that I didn't realize that I had changed my yard so much. But I had to adapt, and move plants that were once doing so well. This happens in the classroom, too. Small changes lead to big ones, and a strategy that had worked well for a long time needs to be removed or replaced. Some people look at my garden and do not see what I see. Where I see an amazing ironweed, a plant with flowers to fuel hummingbirds for their epic migration, they may see a weedy mess. Where I see Virginia creeper, a native groundcover that I am slowwly beginning to love, they see an annoying vine. I understand this and I can't take it personally. Instead, I can be completely explicit and explain what I am doing and what the benefits are. And this happens in the classroom, too. Some people will notice the mess and not see that I have set up a workspace for 30+ people and we don't always put things away. We're too excited to move on to the next thing! Some people will see a student reading what looks like a super-easy book and not realize that this reader, in this year, has made amazing progress. Some people will see a classroom routine created by kids that is still in the fine-tuning stage. Just like in the garden, I have to be explicit and explain what I am doing and why. 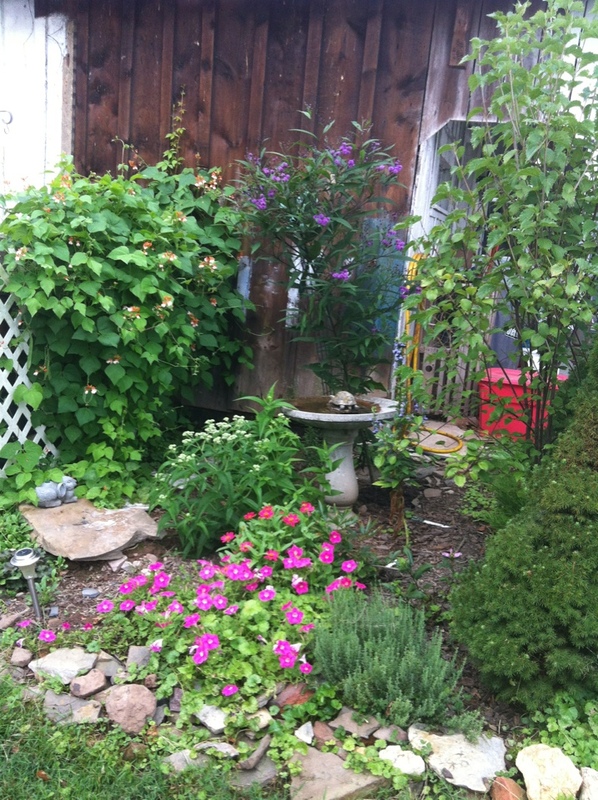 Over the years I've created a garden with the thought that it isn't really "mine" but is shared by all of the other living things who share the space--the bumblebees, the cardinals, the catbirds, the gray tree frogs. This is true in the classroom, to a much stronger degree. The classroom needs to be a shared space, and decisions need to be made for the benefit of all of our members. I am not in charge of everything in the classroom. This is actually very freeing! Several years ago, I became disenchanted with the spelling program that I was using. I've been teaching for a long time, and I've used many different spelling programs. And I've hated them all. A normal person would have said, "Well, this program isn't perfect, but it's what I have. I guess I'll deal with it." I'm not a normal person. So I embarked on a three-year journey to reinvent spelling in my classroom. Along the way, I learned that the most commonly taught roots are not the ones that appear most frequently; that language is a devious, tricky pathway; and that I will always end up hating a spelling program. And that's okay. One of my biggest issues with the spelling program that I had used in the past is the words. They seemed randomly chosen to fit a pattern. What if I could work in the opposite way--select high-utility words, filter them according to their attributes, and then plug them into spelling lists? I started typing in words! My first source, of course, was the Academic Word List by Averil Coxhead. I added words 200-500 from the Fry List, the Nifty Thrifty Fifty, words from the Common Core, and words from a Reading Teacher article about character traits. But just typing the words was too easy. I wanted data! I added columns to the spreadsheet with information about the words--number of syllables, phonograms, root or base, prefix or suffix, mythology link, and use in idioms. It was the work of many winter evenings. The next step was to plan out units. Because this was going to be a fourth grade program, I had to involve the others that I work with in this process. We combined our new PA Core Standards with concepts from the Literacy Continuum to do this. Our units leaned more toward vocabulary and patterns of meaning instead of patterns of spelling. In looking at the core standards, there are so many things related to roots, prefixes, and suffixes that students need. Would I like to do more of the spelling-based patterns? Absolutely! But time is precious, and finite, and I needed to choose. In the long run, I do think that time spent working with prefixes is going to have a stronger impact than time spent working with ei/ie patterns. Because we work in the real world, we limited our units to 12-15. We were planning to teach spelling on alternating days for 30 minutes at a time. A program that can be completed in one year is better than one that claims to do all things for all students, but can never be finished. After Year 2 we rearranged some lists, realizing that putting prefixes and suffixes before word roots is better for students who don't have much experience with semantic analysis. This was my Frankenstein moment--"It's alive!" This was the time to use the filtering capabilities of the Master List to select spelling words. And...it worked! Even better, every list includes high-quality words that students WILL encounter again and again. With each list kids came to me with words that they found in their independent reading books, in their science books, and other academic tasks. Our lists are tiered lists. On Day 1, students take a pretest with Tier 1 words. Students who reach a certain score work from the Tier 2 list for spelling throughout the week. I undertook this step on my own, creating list-specific homework tasks for each list. These tasks are also heavily vocabulary based, with some handwriting included. Of course, I never grade homework, and if you use my materials, please make sure that you don't grade homework either! There is also a list-specific spelling test for each list, including both spelling and vocabulary questions. Everything is included in this folder on Google Drive. You may feel free to use these materials, but obviously do not sell them or distribute them in any other way. Make sure that you are viewing the folder in ABC order so that the files show in the correct order. Like every spelling program, this has parts that I love, and parts that I hate. I really enjoy exploring the meanings of words with students each week. Students especially enjoy the drawing tasks, and their creativity shines as they create new and interesting ways to depict the words. The pretest always invites interesting conversations, as some students try to cheat and correctly spell the words. Why do this on a test that isn't graded? What are they trying to prove? Being open and honest with these discussions gives everyone insight into our classroom routines. I also like that this program is fairly easy for parents to understand and assist with. Definitions for all words are included in my Quizlet links (you can find them all by clicking on my username here). Because what's more fun than starting from scratch? **You may feel free to use and share the Master Word List and the spelling materials here. Please know that these are shared folders and others have added materials! If you find any mistakes, let me know so that I can fix them. If you especially like them, please consider a visit to my store for other classroom materials. I loved creating this passage, which is also available in Spring Paired Passages over on TeachersPayTeachers. Turning a passage set into a digital interactive was challenging, but kids responded well. My students are always eager to read about other places. This activity teaches about the text structure of compare and contrast with content about Australia Day. I like how it combines text structure, reading comprehension, and vocabulary. Digital activities give us the opportunity to put text, video, and student interaction all in one place! This digital activity includes a scaffolded summary, one of my favorite instructional strategies for helping students to learn the academic language of summarizing. Students need lots of practice with choosing the correct form of the word to put in a sentence. 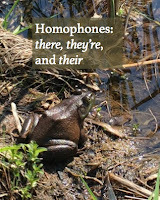 This activity combines a fun video with engaging content--frogs! A few weeks ago, I wrote about exploring nominalizations as a tool for helping readers to understand content area texts. Today, I'll be writing about a teaching tool for content area texts--anticipation guides. Anticipation guides are tools that help readers to consider the propositions in a text before, during, and after reading. Simply put, the teacher creates 4-7 statements related to the big ideas in a text. Students rate whether they agree or disagree with each statement before reading, and then reflect again after reading. There are lots of resources available for creating anticipation guides. Here is the overview from ReadWriteThink, but a simple search will yield many more. Interestingly, each resource shows a slightly different twist on the anticipation guide--which I really like! I am always wary of educational approaches which must be implemented under exact conditions to be effective. In the example to the right, you can see how I've combined a vocabulary preview with the anticipation guide. The text is an introduction to decomposers, and there were key words that I wanted students to be able to read and understand. Students read this text with a partner, and it was interesting to observe the conversations that arose. Some pairs read the entire text first before going back to the text to consider the statements, while others considered each statement as they read. I suspect that preferred methods has something to do with working memory capacity...difficult to prove in the classroom, but intriguing to consider! Whichever method was chosen, students were carefully considering details and main ideas in the text and matching them up to prior knowledge--really important processes. Many of the widely available anticipation guides focus on the affective statements which can be interpreted and argued in multiple ways. As I work with fourth graders, I like to use a mixture of affective and factual statements. When I do this, I use the column headers "Yes" and "No" instead of "Agree" and "Disagree". The guide to the left goes with Follow the Water from Brook to Ocean, one of my favorite picture books for teaching about water and watersheds. I chose statements that would direct student attention to some of the key vocabulary in the text, such as the word reservoir, and some key ideas in the text, such as the movement of water. A unit anticipation guide can work to bring focus to a series of connected texts. This Antarctica anticipation guide was one of my favorite tools over many years. As we read and explored the topic, students referred back to the anticipation guide again and again, talking about which statements were supported by texts and which they were still curious about. Will students erase their first answers? Yup. It's frustrating at first to see students erasing their "Before Reading" replies to make them all correct. Students want to be right, and they want to be able to say that they knew it all before the text. Any good instructional tool can become overused. As Graham Nuthall put it, "...when students experience a narrow range of classroom activities they rapidly lose the ability to distinguish one activity from another in memory. As a consequence, they lose the ability to recall the curriculum content embedded in those activities." I'm very careful to not overuse such a meaningful tool, and I use anticipation guides about once or twice per unit, or every 3-4 texts. As you can see, anticipation guides are great tools to help students get engaged in content area texts. Nuthall, G. 1999. The Way Students Learn: Acquiring Knowledge from an Integrated Science and Social Studies Unit. The Elementary School Journal, 99:4. Pegg, J. and Anne Adams. 2012. Reading for claims and evidence: using anticipation guides in science. Science Scope. Several years ago I decided to circumvent the homework/no homework debate by asking myself, "What would the very best homework actually look like?" Over the next few years, I created month-by-month sets of homework texts with comprehension questions, vocabulary, and wide reading activities. These texts have helped to bring together elements of my reading instruction and provide a unifying structure for the entire year. Last year I was talking (okay, maybe bragging) to my husband about these texts. He teaches third grade and he said, "I wish I had homework texts like that." So of course I set about making a different set of homework texts for him! From the start, we talked about what he envisioned for his third graders and what he wanted to the texts to look like. Like me, he prefers routine homework that students can complete over a week or two. He prefers a very simple, uncluttered style for classroom materials, so we made a cover sheet that looks like this. Then, we discussed the texts. He requested narrative texts for the first set--a tall order, as stories are much more difficult for me to write than nonfiction. I settled on a short snippet for practicing visualizing, a story called "The Recess Troll" in two parts, and "A School Surprise". "A School Surprise" turned out very well, if I do say so myself--it's tough to tell a complete historical fiction story in two pages! While my fourth/fifth grade reading homework texts include multiple choice questions for comprehension, these packets include open-ended questions. This helps students to avoid guessing and really think about the questions. A simple vocabulary assessment for each text helps students to see if they have learned the words. It's also great practice in using context clues and working with CLOZE readings. After creating the set, it took some polishing and tweaking to add a teaching guide, answers, and full description. (My husband: "Hey, you never gave me an answer key!") A set of expository passages will be available shortly. These texts and activities fill so many gaps in our classrooms. Because they are so useful and important, I provide time for students to work on them in class; they are also a great tool to use when an instructional assistant or volunteer needs something to work on with a student. They are not just mindless worksheets, but real texts with meaningful tasks.